This is actually a super old Ulta3 polish called Wild. This was three coats over one coat of Ulta3 Midnight. Then a coat of Seche Vite. It's so magnificent that I just keep looking at my nails. My mum and I had always overlooked this polish, as it's a little hard to get the flakies out of the bottle and it usually just looks - meh! But over midnight blue WOW. Mum wants me to try it over a deep red, to really get the whole opal thing going. I promise I will mum! I'm sure I used to have an orange Ulta3 flakey polish too, but I threw it out (oohh the shame!) because it had totally dried up. (If only I had discovered Seche Restore back then). Please Ulta3 - bring back the flakey polishes. That is so gorgeous! All I can say is WOW! Wow that is so cool!!! Maybe the new hype over the polishes will make the company rethink their marketing and ranges!!! 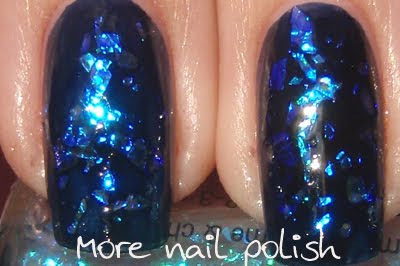 The Flakeys really are fantastic - its the irregularity of the sparkles that really grab me. I think with so many fabulous colors available in the market place, people are often looking for something off the wall and different. The Crackles, Mood colors, Sparkles, Flakeys etc etc - This is what I'd love to see more of. WizardsofBling - Thanks so much - I agree. dcallaway - I'm just like you! I love the polishes that are a bit off the wall. I'm going to have to get some of the new crackle polishes from BYS, and somehow (beg, borrow or steal) get some of the Claire's mood polishes from the USA. 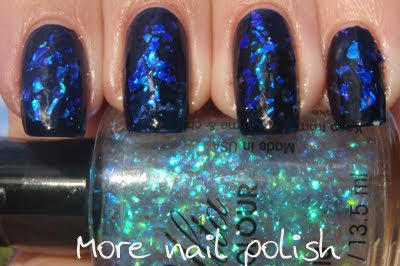 I'm also going to get some of the Nfu oh flakey polishes as they look amazing in other peoples swatches.